It’s no understatement to say that my stopover in South Georgia during my Antarctica cruise with Hurtigruten was the best wildlife experience that I have ever done in my life! 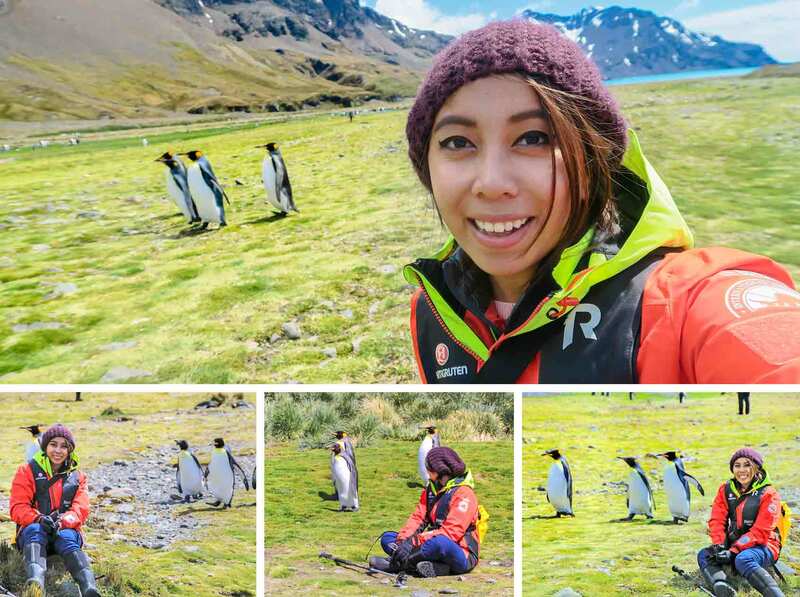 After all, this island is often called as the paradise of wildlife-lovers given the huge number of Antarctic animals that lead their lives there with little to no concern for the occasional human visits. Though, if I may be so bold to say… I wasn’t actually expecting something unprecedented from such sub-Antarctic islands because I thought that all the ‘fun’ will be found in the White Continent itself; so naturally, it was a welcomed feeling when I was blown away by the beauty of the remote South Georgia island! Before you start confusing this with the country of Georgia or the USA state of Georgia, let me make clear that South Georgia is an island in the southern Atlantic Ocean. It was first found in 1675 and it is currently a part of the British Overseas Territory of South Georgia and the South Sandwich Islands. It is NOT part of the Antarctic continent but it does lie south of the Antarctic Convergence (curve encircling Antarctica) and regarded as a sub-Antarctic island. 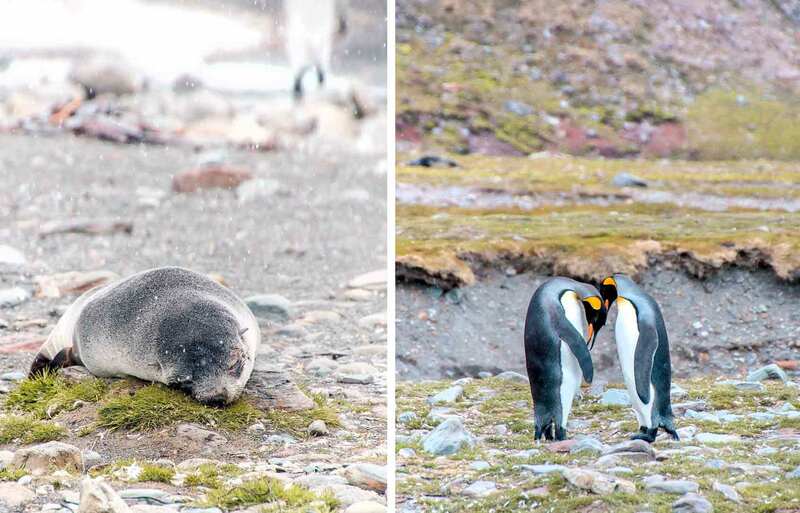 When it comes to the population, there is no permanent inhabitants in South Georgia but there resides a British Government Officer, Deputy Postmaster, scientists, and support staff from the British Antarctic Survey — not to mention, the ‘local’ colonies of adorable penguins and seals! Truth be told, this was my first time to get incredibly close to such wildlife (in a way wherein they were SO close to my feet!). It was really incredible. And the icing to the cake? I even got to witness a colony that was made up of almost a MILLION of king penguins! …Wanna know more about this adventure? Then continue reading below. (If you’re curious on how you can visit this magical island, go to my Pre-Travel Guide at the bottom of this post). Fortuna Bay which is located in the north coast of South Georgia was our first shore landing, and from the moment that I set foot in it, I was lost for words. It was not only because of the grand vistas that I’ve laid my eyes on but also because of the thousands of elephant seals, fur seals, and king penguins that greeted us by the beach. As a matter of fact, we were practically surrounded by these adorable creatures and it was pure bliss! But amidst the excitement, we had to be vigilant because the fur seals are quite aggressive (more details on this if you click the ‘+’ icon below). Isn’t he adorable? But take my advice: don’t let this fluffy creature fool you because for the most part, he’s one of the ‘thugs’ in Fortuna Bay. How so? Well, they often tend to be on ‘attack mode’ and when they charge, they are FAST even if they weigh about 90 to 215 kilograms! That’s why when we made landing at South Georgia, we were all told to remain alert because the whole of Fortuna Bay was filled with fur seals and they can charge at anyone if they felt like it. Needless to say, you bet that I felt like I was in a ‘seal SURVIVAL GAME’! It was all good fun though and they rarely ‘attacked’. And in time, the ‘dominance display’ between human and seal all just became second nature to us. (Mind you, the king penguins in the island also had to go through the same ordeal with the fur seals. I witnessed a lot of them tripping and running whenever a seal decides to charge at them playfully). ★ So… why are the fur seals aggressive? It’s mostly the male ones that are always in attack mode. The main reason? They think we’re out to steal their girls. LOL. But yeah, I’m not joking! Competition for mates is fierce in the island — and so is space. However, they can attack with little to NO obvious provocation to any intruders (may it be fellow fur seals, humans or penguins alike). Female fur seals also get aggressive to protect their pup; but during my time there, the females were all just lounging around while the pups are out and about playing far from them. Regardless, the pups can be feisty too since I did encounter one who hissed at me; but as you might expect, it was not scary like the adult ones — it was rather freaking adorable. ★ What to do when the fur seals get aggressive? We were all equipped with hiking sticks not just for ‘hiking’ but also for the seals. Of course, it was NOT an item to hit the fur seals with; it’s just a precautionary tool that seem to make fur seals stop charging at you when you just point it at their direction. Otherwise, you can clap your hands to startle them (as if payback for them startling you haha). If things get worse and you’re surrounded by a lot of fur seals, you just need to make a lot of noise to somewhat express dominance. Bottom line: you still always need to be careful because a seal’s bite can be lethal. (I gotta say… this experience made me think that it would make for a good game app idea — “Survive the Seal Attack”). We knew we were in the safest path possible from the fur seals when the king penguins also followed the marked cones that our expedition team leaders set up for us! Fur seal ‘thugs‘ aside (they didn’t bother us as much anyway), the terrain in South Georgia was just too spectacular: it was wild, rugged — and with everything combined, my time there truly felt like I was doing my own wildlife documentary! ABOVE: These are fur seal pups and they were often seen playing far away from their mothers. ABOVE: A southern elephant seal pup who yet has to form a large nose that resembles an elephant’s trunk. Once it matures into an adult, it can reach a length of 6 meters and a weight of 4,000 kilograms! (And yes, they’re not aggressive like the fur seals). ABOVE: This is a baby king penguin! They shed this brown coat for months through a process called moulting until they finally achieve the ‘signature look’ of adult king penguins. Seeing them now, they really look different, right? In fact, early explorers thought they were an entirely different animal when they first saw them! TRIVIA: We were advised to maintain a 5-meter distance from the penguins so as not to stress them — of course, touching is NOT allowed either. However, most of them were curious creatures who did not fear us (given that they are NOT used to any danger on solid ground nor land predators) so there were many instances wherein they were super close to us; which then makes for a great experience (other than it being a great opportunity for taking amazing photos and videos!). So simply put: we don’t approach them, we let them approach us! And if I may share a tip, if you just sit still, most of the time, they’ll just approach you. Another amazing thing about South Georgia is that its trails are rated as one of the world’s most epic hikes — naturally, I didn’t pass up on doing the popular Shackleton Hike when there was an opportunity to do so. TRIVIA: Ernest Shackleton is one of the famed great explorers of Antarctica and he once did a heroic rescue journey of survival through South Georgia for 35.5km in the height of the Antarctic winter. Visitors to Antarctica have the chance to retrace his steps in the summer; but surely, with the time that we had, we can’t do a full 35km hike. Even so, we had the chance to enjoy a 5km hike from Fortuna Bay which basically goes through the last leg of Shackleton as he made his way to Stromness. It may have been short, but I loved it! Together with Hurtigruten’s expert expedition leaders, we went through snow and glacier lakes backdropped by snow-capped mountains. The weather was perfect too so we had the chance to see the surrounding terrain in all its glory. Still in South Georgia, you will also find abandoned whaling stations such as that of Grytviken Harbour (which is also the location of Shackleton’s grave). There were several activities to choose from while we were there: guided tours, cruising on polarcirkel boats, hiking, and kayaking — but as what you might have already guessed, I went with hiking! You’ve seen me mingling with tons of king penguins in Fortuna Bay, but here in St. Andrews Bay… they just rule in numbers as I got to see almost a MILLION of them! It was a sight that definitely made me frozen in disbelief; besides, it was simply too crazy and surreal to see thousands of king penguins filling up every available space in the bay whilst their unique chirping circulated through the air like a loud orchestra. (And let’s not forget the thousands of elephant and fur seals that occupied the sands by the sea). …All in all, I will NEVER forget this bay’s views, sounds, and smells (haha). Things got even more magical when snow started to fall — which mind you, was also my first snowfall experience last 2017. Needless to say, I was brimming with happiness here and I wasn’t even in mainland Antarctica yet! TRIVIA: One thing that you must know about St. Andrews Bay is that due to its natural design and position in the Southern Ocean, it has a lot of swells (collection of waves typically loved by surfers but not by boaters or expeditioners like) and heavy surf. Therefore, visitors must visit on a good day, otherwise it will not be possible to get ashore; hence, I’m thankful that the days were fair and good. To reach this huge colony, we actually had to cross a glacial stream first which is said to sometimes be easy but also challenging depending on the time of the arrival. For us, it was bordering on challenging but fortunately, we all made it over the other side, thanks to the assistance of the expedition leaders. From there, we had to go up on the hills and once I got to the top… my jaw literally dropped to the floor. The view was immensely breathtaking and vivid! How can I get to South Georgia? By cruise ship. As one of the most remote places in the world (with no airstrips), accessing South Georgia can only be done by sea. The MOST common way to do it? By joining a cruise ship expedition that sails to Antarctica. 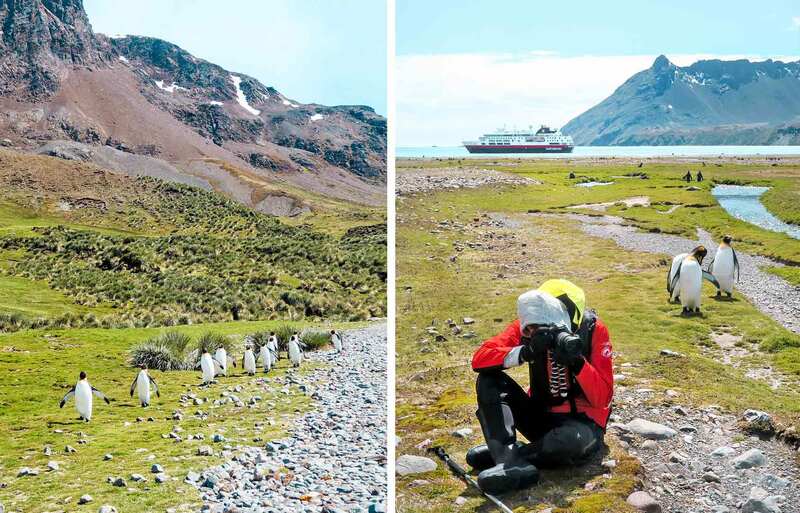 To date, there are over 80 companies who belong to IAATO (International Association of Antarctica Tour Operators) and the cruise can start and end from any of these locations: Ushuaia in Argentina, Punta Arenas in Chile, Bluff in New Zealand or Hobart in Australia. It helps to note though that landing in South Georgia wholly depends on the provider and the kind of cruise expedition that they offer; so make sure that you pick one that involves a stopover in South Georgia. All the same, you must remember that every shore landing depends on weather and water conditions; hence, it is possible that you might not land at all sometimes. Nevertheless, I went with Hurtigruten on their 20-day Antarctica expedition and it involved 3 amazing days in South Georgia. As such, I would highly recommend them! By private boat. If you’ve got your own boat and are brave enough to go against the rough seas, you must first get prior approval of your itinerary with South Georgia. To apply, application forms are available online and some of the main requirements are for you to acquire insurance and to prove that you are self-sufficient. The fee is also at about £105 per passenger for visits of up to 3 days. In any event, I would recommend going with an IAATO-approved cruise ship like Hurtigruten because for starters, they are given greater access to landing sites (and they’re more hassle-free). When is the best time to visit Antarctica or South Georgia? Antarctica is accessible to tourists during the Antarctic summer season which is between November and March because this is the time when the ice starts to break and the temperature gets warmer thereby providing a better environment for cruise or expedition ships. That being said, these are also the only months wherein visits to South Georgia is possible (I went there in December and the weather was perfect). How much does it cost to go on an Antarctic cruise expedition? Antarctica is obviously NOT a budget destination given how most cruise expeditions start at a price of $5,000 per person. However, there’s the possibility of paying only $4,000 if you manage to get a last minute deal in Ushuaia (the main starting point of cruise ships in Argentina) during November or December. This option is only ideal if you have the time and patience to wait for a chance to come by — which they say can be quite rare. Yet again, it’s worth a shot! For a more hassle-free experience, naturally, it’s better to book in advance. Hurtigruten‘s expeditions usually start at $5,000 per person (my 20-day expedition’s cost starts at $17,000). But if I may add a tip: if you email Hurtigruten via [email protected] and mention my promo code ‘IAMAILEEN’, you will get a special discounted price quote! Do I need a visa to go to Antarctica and South Georgia? Since there is NO single country or government who owns nor controls Antarctica, visitors technically do NOT need visas. However, with the existence of the Antarctic Treaty’s Protocol on Environmental Protection, it requires visitors (who are citizens of countries that are signatories of this treaty: including USA, Canada, EU, and Australia) to acquire a permit prior to visiting Antarctica. These permits are almost always acquired through tour operators. EXAMPLE: If you booked via a cruise ship, permits are covered by the cruise company that you’re going with. If in doubt, you could always ask your Antarctica tour operator. As for South Georgia, if you’re coming with a cruise ship, they will take care of all permits for you so you’re focused on the trip itself! Meanwhile, like I’ve already discussed, most ships and vessels depart from ports in places like Argentina, Chile, Falkland Islands, New Zealand, and South Africa. Depending on your nationality, you might need a visa to be able to set foot on the ports of any of these said countries in order to start your voyage to Antarctica. So for my case, since I’m a Philippine passport holder and my cruise started in Ushuaia, Argentina, I needed to apply for an Argentina Visa. As such, it is your responsibility to check if you need visas to any of the aforementioned starting ports. What currencies should I bring to Antarctica and South Georgia? Antarctica is not a country, so it does NOT have its own currency. However, there will be some places in the Antarctic Peninsula such as Port Lockroy (where you can find the Penguin Post Office museum and souvenir shop) and some research station facilities that will sell some stuff to visitors. With them, currencies like the USA dollars, Pound Sterling and Euro are generally accepted (together with MasterCard and Visa cards). For South Georgia, the only place where you can have some use for your money is the small shop in Grytviken where you can buy souvenirs and postcard stamps. In there, they accept British Pound Sterling, USA dollars and Euro. NOTE: If you want a complete list of FAQ (Frequently Asked Questions) for Antarctica cruise expeditions, stay tuned for my upcoming post on this. South Georgia is a place that I will always remember and a place that I will forever recommend as a must-visit destination! After all, the unrivalled wildlife encounters that I’ve experienced here were beyond incredible that I was always at a loss for words. All in all, I hope you get to see this place because it will surely blow you away! What do you think of South Georgia? Would you like to visit here too? Why or why not? Thank you so much for such a great article. We are planning this trip in 2019. I have a question for you regarding the excursions on South Georgia Island. Does Hurtigruten include some as part of the cruise or do all of them require an additional fee? I understand the Antarctica landings are included but haven't been able to find the facts on the S. Georgia landings. Hey Paul, as long as the Hurtigruten cruise includes a stop in South Georgia (you'll see it under the itinerary section), you don't have to pay any additional fee and you'll get to enjoy the island on every landing. Hope that helps! Very usefull and informative information provided by you. i have so excited to see good things about Antarctica wildlife. There is no doubt in assuming that you had a really good time but the thing is this place is literally blessed with nature's sermons. One thing that I want to know that is there any particular camera or lens you are using for clicking these lovely photographs?. I simply loved them. It really is! I hope you get to experience it! WOW just WOW your photography is incredible!!! What a wonderful post, the wildlife, penguins and seals! Simply stunning. Oh gosh this looks like such an amazing adventure. You are living my dream. I would love to go see the penguins in person. I saw seals at La Jolla and it was just magical to see them close up.